The Trinidad II DC ceiling fan combines a minimalist, modern design with impressive features. It features three unique, ABS Plastic blades which would be the ideal addition to any modern designed interior. It contains an energy saving DC motor, reaching approximately 30W on top speed. 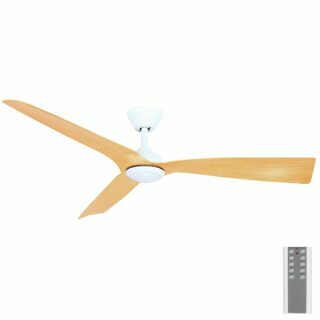 This ceiling fan includes a 6 speed remote control and will also allow you to easily adjust to summer or winter settings from the remote. The Trinidad 2 by Mercator and is available in various colours. This model is with light – for the model without an integrated LED light, please see alternative listing. The total drop of the fan from ceiling to blade is approximately 250mm. 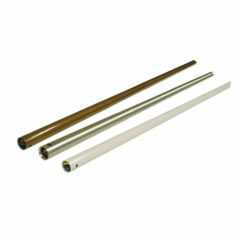 90cm (900mm) extension rod to suit Fanco Infinity with LED and Mercator Trinidad II with LED ceiling fans. Available in this fixed size which can be cut to size by the installer. Available in white and black colour options.